Absolute Fire Protection, Inc. offers a steady and challenging career path. We have tremendous opportunities for those self-starting people who are looking for a challenge and ready for change. 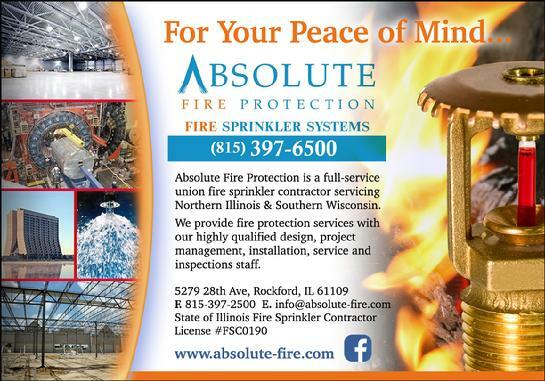 If you like a fast-paced, high performance work environment, consider Absolute Fire Protection, Inc. Explore our web site to sample the exciting and unique projects we seek, never a dull moment. Ask for John Danis or Chris Howard. Absolute Fire Protection is looking for qualified candidates to fill the position of Designer. You must have a minimum of 5 years of fire sprinkler experience with a design/build fire sprinkler contractor to qualify. Freelance or contract arrangements will NOT be considered. We are looking for people who want to grow with us and be a part of the future. We offer full benefits and competitive salary. We value hard work, innovation, and having fun. Don't just find another job, start a career! A Designer is responsible to produce design related documents to ensure the scope of the fire sprinkler system is fully communicated to our installation personnel at the assigned job site. He/she performs design work and also directs the work of others as assigned. High school diploma or equivalent. Strong understanding of materials, tools, equipment, and procedures used in the installation and design processes, plus working knowledge of NFPA Standards. Mental stamina and ability to perform laborious and repetitive work for extended hours, including overtime if necessary. Good communication, training, and planning skills. Sense of pride, integrity, and organizational ability. Must enjoy working independently and with others. Experience with HydraCAD software. Minimum of 5 years design experience. Possess a valid driver’s license and meet all Insurance Carrier requirements. NICET certification in fire sprinkler layout and design.